The surviving documentary evidence of Pierre Moulu’s life amounts to very little: documents in the Vatican identify a Petrus Moulu, a cleric of the diocese of Meaux between the years 1505 (when he stated that he was in his twenty-first year) and 1513, who applied for permission for various privileges in that diocese. Whether this man can be identified with the composer of five Mass settings, approximately twenty motets and ten chansons seeming to date from the second and third decades of the sixteenth century, is not proven, but is the best assumption presently available. Moulu the composer thus joins the long lists of Renaissance musicians whose lives are all but entirely masked in shadow. Fortunately a number of his works found favour with his contemporaries to the extent that they appear in numerous early manuscripts and prints, and they have attracted the attention of music historians since the earliest days of the discipline in the late nineteenth century. Like much of the large repertory of sixteenth-century polyphony, however, his works have rarely been performed in modern times, and this is the first recording devoted to his music. Moulu’s most celebrated work is the Missa Alma redemptoris mater, which was noticed as early as the 1870s by the pioneering musicologist August Wilhelm Ambros. Subsequently it has warranted mention in the standard late twentieth-century histories of Renaissance music by Gustave Reese and Howard Mayer Brown. The reason that an otherwise unknown composer attracted this level of attention is the canon under which this Mass setting operates. (‘Canon’ here refers to any formal law governing a piece, rather than the narrower sense of two voices with exactly the same notes that the term later assumed.) At the head of the piece is the Latin instruction ‘Tolle moras, placido maneant suspiria cantu’ (literally, ‘lift up [i.e. remove] the pauses: let the breaths of the song calmly remain’). Some sources also carry the vernacular ‘Si vous voulez avoir messe de cours / Chantes sans pauses en souspirant de cours’ (‘If you want to have a short Mass / Sing without rests, breathing briefly’). The meaning is that the Mass can be sung either with or without all of the rests of a semibreve or greater: the polyphony is composed so as to fit together in two combinations. Although this technique is not quite unique, the Missa Alma redemptoris mater is by far the most extensive example of its use in Renaissance music. (Other pieces of this kind include a canonic motet also by Moulu and discussed—alongside another such piece, by Costanzo Porta—in an early seventeenth-century treatise on music of Lodovico Zacconi; a fantasia con e senza pause by the English-based Fleming Philip van Wilder; and a setting of the Marian antiphon Regina caeli by Pierre de Manchicourt (c1510–1564) in which the second-highest voice is derived from the highest by removing the rests. Manchicourt’s motet has been recorded by The Brabant Ensemble on Hyperion CDA67604.) Moulu’s Mass thus fits into a long-standing tradition of generating musical compositions that obey mathematical constraints, frequently of considerable complexity. The existence of such pieces underlines the close association of mathematics and music in late-medieval conception: the singers who would have performed such complex works were highly specialized professionals, often in direct contact with the composer, and well able to deal with the challenges of cryptic notation. However, by circa 1520 when Moulu was active, the new technology of music printing was bringing compositions to a much broader public than heretofore, and consequently not all potential recipients of his music could be expected to comprehend the canon or resolve it correctly. The problems caused by Moulu’s canon are evident in the Mass’s sixteenth-century sources (which number an impressive fifteen when one includes those such as theoretical treatises or collections of two-voice pieces which transmit only sections of the work). Although in a modern score it is necessary to notate the two versions entirely separately, the sixteenth-century practice of notating voices singly—whether in separate partbooks or large choirbooks with each voice in a block in one corner of the double page—allows both versions to be notated at the same time. The singers then simply ignore the longer rests when singing the short version. Because the number of such rests is not the same in each voice, however, some voices (in one or other version) will need to finish before reaching the last note, so as to cadence together with their colleagues. The places where this is to happen are indicated by the use of a signum congruentiae or sign of congruence, similar in appearance to the ‘dal segno’ symbols found in later music. This system evidently caused considerable confusion: partly this is due to Moulu’s ingenuity in varying his practice—sometimes it is the short version that must omit certain parts of the music, sometimes the long version, and no source ever indicates which. Further problems were caused by the editor of the earliest printed source (Rome, 1522) failing to reproduce correctly this and several other aspects of the Mass, necessitating remedial work by those who relied on this edition. The consequence is that Moulu’s Mass took on a number of different forms as the century progressed. For some scribes, for instance, the dual nature of the piece was beyond what they felt their performing forces could manage, and the sources that they copied avoid the issue entirely by presenting only the ‘short’ version of the piece, without the rests. One of these can be shown to have been copied from a complete version, which together with the omission of the third Agnus Dei—where the texture is expanded from four to five voices—gives a clear indication of where the scribe saw his choir’s abilities to end. The present recording presents the short version of the Mass complete, together with two movements from the long version. It will be noted that the polyphony is not precisely the same between the two: the numerous sources take different approaches to certain of the melodic decorations, and the present performance adopts slightly varying readings in some places. One of the crucial constraints on the composer of this type of canon is that suspended dissonance (where a note held from a weak to a strong beat becomes dissonant against a new harmony on the strong beat) is difficult to fit against two different harmonies, so Moulu relies rather more on anticipation dissonance, amongst other types. (An example is the penultimate chord of the Agnus Dei in the long version—this dissonance is quite impermissible according to the rules derived by counterpoint pedagogues from Palestrina’s practice, and perhaps as a consequence is bowdlerized in several of the sources.) As well as the achievement of writing an entire Mass under such strict constraints, Moulu can be seen to have created an artwork of expressive beauty. Several pieces from the fourteenth to sixteenth centuries are known as ‘musician motets’ due to their inclusion of named composers. Moulu’s Mater floreat, preserved uniquely in a manuscript presented to Lorenzo II de’ Medici at his wedding in 1518, has one of the longest lists of musicians, including the leading international figures within living memory, from Du Fay through Regis, Busnois, Basiron, Agricola, Obrecht, and so on, finishing with ‘the incomparable Josquin’. The second half of the piece is more particular to the French court, beginning its list of names with Antoine de Longueval, who had become master of the royal chapel in 1515. De Longueval receives the longest share of music in the whole of Moulu’s motet—nineteen bars as against Josquin’s eleven—yet today he his hardly remembered, and of his compositions only two motets, a chanson, and a questionably attributed Passion survive. The remaining French chapel musicians listed are largely minor figures, known to specialists but rarely performed today, with the exception of Jean Mouton. Heinrich Isaac, who is also mentioned in this part of the motet, has no known connection with the Paris court. That Moulu listed so many musicians who were active at Paris has in the past been taken as indicating that he himself was among their number: more recently, however, a comprehensive survey of music at the court (Christelle Cazaux, La musique à la cour de François I, 2002) revealed no evidence of his presence. It is possible that future research will identify Moulu in some other (perhaps not specifically musical) role at court; in the meantime David Fallows has argued that Mater floreat is best viewed as having been written for entertainment at Meaux rather than in the court environment. This would certainly go some way to explaining the composer’s use of rather obvious Latin puns such as ‘laughing’ or, we might say, ‘hilarious Hilaire’ and ‘fortunate Divitis’ (the latter being a Latinization of ‘Le Riche’ or a similar vernacular name). Quite how the motet made its way into one of the sixteenth century’s most impressive presentation manuscripts for the nobility, if so, remains an open question. The Compline responsory In pace represents Moulu at the opposite end of his compositional style from Mater floreat. Whereas the latter is forthright and declamatory, highlighting the named composers and employing fanfare-like imitative points to begin and end the piece to the glory of France’s king and queen, In pace responds to its text by creating a dreamlike soundscape, with long, highly melismatic lines and few obvious cadences. The texture is based around the lower voices: the tenor operates in canon at the upper fifth (in the ‘Gloria Patri’ the upper voice leads and the tenor follows) and, as in many canonic pieces at this time, is largely in longer notes and has a restricted range. It is left to the three free parts to weave the melismatic texture around these two fixed points, therefore. The text was set by several composers in the first half of the sixteenth century, and unusually for responsory settings, the polyphony is given—by others such as the Englishmen John Blitheman, John Taverner, and John Sheppard as well as Moulu—to the sections that would be sung by a soloist in performance of the plainsong responsory. 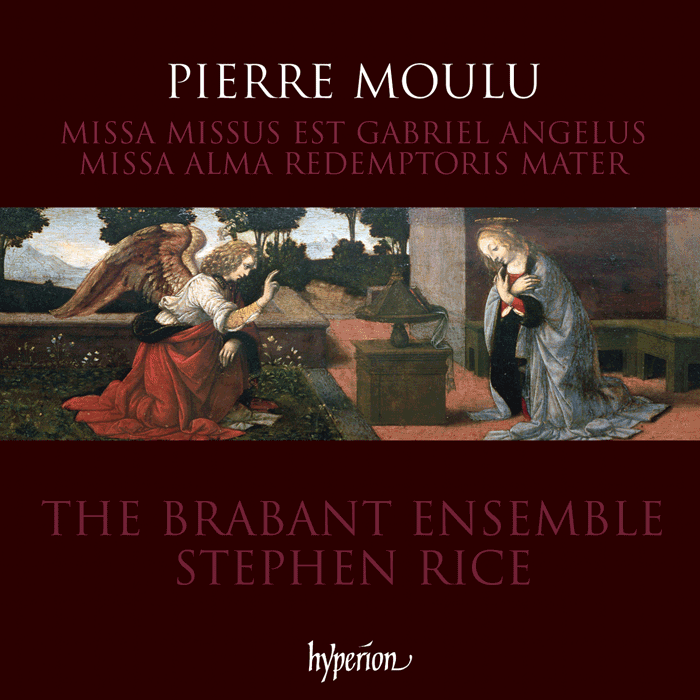 Missa Missus est Gabriel angelus perhaps represents Moulu’s finest achievement in terms of purely musical expression. Pierre de Ronsard in the introduction to his Livre de mellanges of 1560 described Moulu as a disciple of Josquin (he was numbered alongside eight others, Ronsard’s selection of names exhibiting a notable bias to musicians active in the region of Paris). If a connection between Moulu and Josquin—for which there is no documentary evidence—did exist, this Mass-setting based on a short motet by the older composer would seem to represent the closest approach between their respective styles. Josquin’s motet is characteristic of his four-voice writing in maintaining a sparse texture with the voices imitating strongly memorable phrases. The characteristic rising leap of a fifth at the beginning of the piece exemplifies this trait of Josquin: frequently the voices work in pairs, as at ‘nuntians ei verbum’. Appropriation of plainsong melodies is common in Josquin’s music, as is true of many Renaissance composers: in Missus est Gabrielthis is most clearly seen at the words ‘Ave Maria’, where the famous chant is strikingly introduced in the bass, the other voices following at a distance of two breves, all on the same pitch. Finally the closing ‘Alleluia’ is set to an evocative ‘fauxbourdon’ texture—a succession of first inversion chords that frequently was associated with sweetness in early sixteenth-century music. A final characteristic of Josquin that Moulu adopts and extends is strategic repetition. Josquin is known for repeating the same short motif several times in succession (a famous example occurs in the Kyrie of his Pange lingua Mass), and Moulu takes this to almost obsessive levels at times. In the ‘Pleni’ of Missa Missus est Gabriel, which is for the two upper voices only, the same four-note motif occurs no fewer than five times in succession in the soprano (Track 5, from 1’45”), and at the end of this section (2’25”) the alto has four statements of the same melodic fragment. I interpret the musical gesture of the soprano statement as intensifying a drive towards the cadence that is frequently found in early Renaissance music; additionally the ‘Pleni’ exemplifies the concept of varietas, much prized in theoretical treatises of the time, in that while one voice repeats, the other is continuously fashioning new counterpoints against it, working the melodic material to its utmost. The Mass-setting as a whole exhibits an austere beauty that recalls its distinguished model without slavishly aping it.